Workers at Lonmin's (LON:JSE) Marikana mine have accepted a 22% pay increase to end more than five weeks of deadly strikes. The agreement reached Tuesday also includes a once-off payment of $250 (2,000 rand) to partly account for their wage loss while on strike, said Associated Press Bishop Joe Seoka, a member of the negotiating team. Also today, world number one platinum producer Anglo American Platinum said it had resumed its operations in the strike-hit Rustenburg area. "Anglo American Platinum Limited confirms that all of its Rustenburg operations have resumed, effective from today's morning shift," the company said in a statement. 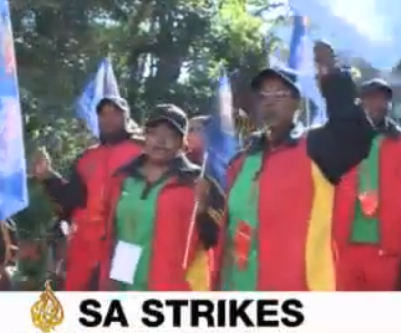 South Africa’s mining sector, which accounts for 6% of gross domestic product, has been repeatedly hit by disputes over low wages that reflect widespread anger over enduring inequalities in the economy. Image courtesy of Al Jazeera English, via YouTube.